Since 1980, the veterinarians and support staff at Valley West and Elk Valley Veterinary Hospitals have sought to achieve the highest standards of veterinary medicine. We feel that cats are part of the family, yours and ours. That is why our Valley West location took steps to become a Cat Friendly Practice, certified by the American Association of Feline Practitioners. Our Elk Valley doctors and staff have also been thoroughly trained in cat-friendly techniques that decrease stress for feline patients and their owners. Whichever location you choose, you can be sure that your cat will receive elevated and high-quality care throughout every single visit. Our clients' response to the care we provide is the strongest testament to the quality of care we provide for their cats. The Valley West and Elk Valley Veterinary Hospitals veterinary hospital offers preventative health care as well as advanced diagnostic and surgical services. Our commitment to quality service has lead our cat care clinic to become well known and respected throughout the veterinary industry. Since 1980, our veterinarians have been accredited by the American Animal Hospital Association. 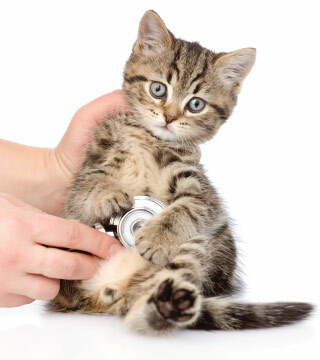 Because the medical needs of cats are unique, our cat hospital utilizes specialized equipment, training of employees and facilities specific to felines. We have a dedicated feline only examination room and we minimize stress by utilizing feline pheromones and soft cozy surfaces which will allow your cat to feel safe and secure. Our staff are trained to allow cats to move at their own pace which allows them to feel less stress during their visit to our hospital. Cats have special needs when it comes to exploring new environments. We understand the needs of cats and how to keep their stress to a minimum. While we cannot make all cats feel completely at home, we can help all cats to feel safe and comfortable during their visit to Valley West and Elk Valley Veterinary Hospitals.